Sadly, only 3 episodes from this series survive. It was thought that only one episode survived, episode 4. All the others no longer exist in the BBC archives. David Croft announced a national search for the remaining 5 episodes and eventually episodes 1 & 2 were found. These have since been painstakingly restored and preserved. If anyone does know anything about the 3 missing episodes then please do e-mail me. Episode 1 : "Operation Kilt"
Captain Ogilvy of the Highland Regiment arrives whilst the platoon are doing their PT lesson, to brief them about Saturday night's manoeuvres. 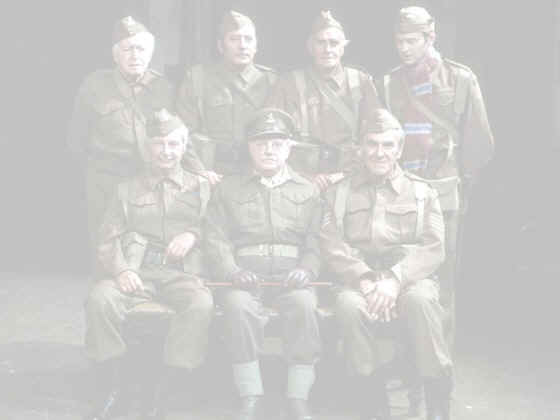 Six of his own regiment will try and capture Mainwarings H.Q. The platoon outnumbers Ogilvys gang by 3 to 1, so they think it should be easy. They try to discover the regiments plans and one way is to disguise 2 of the platoon as a pantomime cow! The platoon ends up making traps in the wood, only to find Jones hanging upside down in one of them! Episode 2 : "The Battle Of Godfreys Cottage"
Private Walker is eventually called up, which doesn't please most of the platoon because Walker can get them stuff on the black market such as booze and cigarettes. Mainwaring tries to fight the War Office to reverse the decision, but fails and Walker ends up in the army. To the relief of the platoon he is discharged within a matter of days, it is found he has an allergy to corned beef! Episode 4 : "Sgt.Wilsons Little Secret"
Mrs Pike receives a letter from the WVS asking her to take in an evacuee. She is overheard by Sgt Wilson telling Pike the news saying "it will be nice being a mother again" and Wilson assumes she is pregnant. He confides in Captain Mainwaring who says that he should do the decent thing and marry her. Whilst practising the wedding march, with Jones standing in for Mrs Pike, she arrives with the evacuee and Wilson realises his mistake, He breathes a sigh of relief. Mainwaring is allowed to promote someone to Corporal. Jones and Fraser are the 2 contenders. There is much rivalry and competition between the 2 men and Mainwaring prefers Fraser for the job. But when Fraser presents charge sheets for Walker, Pike and even Jones, Captain Mainwaring takes him out of contention for promotion, much to the relief of the platoon. Whilst the platoon are watching for fire-bombs, Fraser sees a light flashing on Mortimer Street and they suspect a spy signalling to an overhead plane. They arrest the suspect, a Mr Murphy, who claims to be British even tough he was born in Austria. Whilst all this is going on an incendiary device lands on the church hall and causes a fire. Mrs Pike ends up putting out the fire with sandbags and also vouches for Mr Murphy, he was married to her Auntie Ethels cousin.